The 1st Battalion the Royal Malta Regiment of Militia was raised on 1 May 1889 for the defence of the Maltese Islands. A cadet company, the first company in the regiment, was included in the establishment. Lt Col Fredrick Gatt RMFA assumed command of the regiment which by the end of 1889 had a Strength of 1,131 men. Sgt Maj WO1 W. Morrison 42nd Royal Highlanders was appointed Sergeant Major. The first recruit was Dr E L Vella a member of the Malta Council who within a year became a Lieutenant in the Corps. Battalion HQ with seven companies was in Valletta while the remaining three companies were detached between Vittoriosa, Notabile, Naxxar and Zebbug. Army Order 441 dated November 1889 granted the honour MDCCC (1800) to the Royal Malta Regiment of Militia in commemoration of its services during the siege of Valletta from 1798 to 1800. 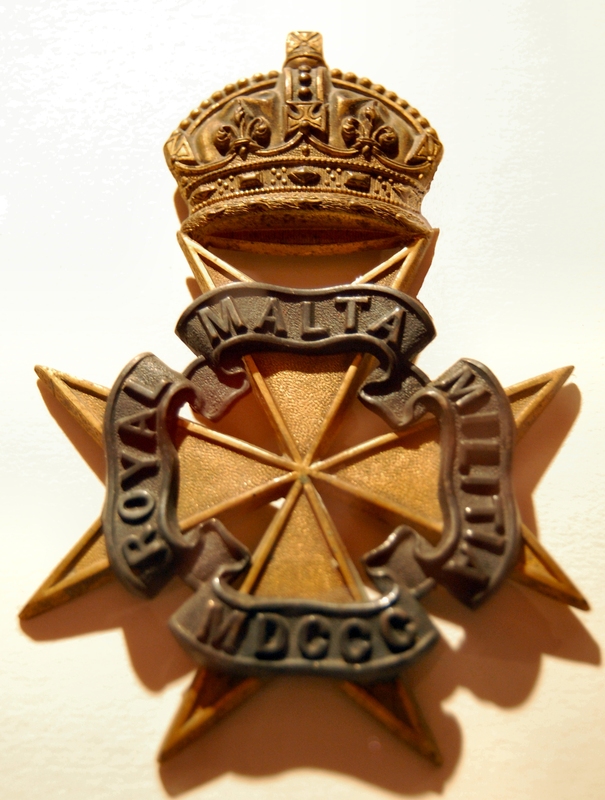 Under the authority of Army Order 295 of 1924 the honour was borne by The King's Own Malta Regiment. On 1 June 1903 the RMRM was designated The 1st/The King's Own Malta Regiment of Militia following King Edward VII's visit to Malta in April 1903. 19 Oct 1888 Ordinance No 4 was enacted by Governor Sir Henry D'Oyley Torrens and appeared in the Government Gazette No 3315 dated 29 April 1889. The ordinance laid down the terms of service for a new infantry regiment designated the Royal Malta Regiment of Militia. Lt Col Frederick Gatt RMA became its first commanding officer. He was gazetted on 8 April 1889. The second-in-command was Major Gerald Strickland. On 1 May 1889 Sir Torrens was appointed Honorary Colonel of the regiment. HQ and seven companies were in Valletta while the remaining three companies were detached to Notabile, Vittoriosa, Naxxar, and Zebbug. The militiamen enrolled for a term of five years and were allowed to re-engage for a further four years. Each man was required to attend a minimum of 50 drill days during the year. 10 May 1890 Lieut Gen Henry Smyth succeeded Sir Torrens as Honorary Colonel of the regiment. One surgeon was added to the establishment in 1890. 31 Jan 1891 The regiment was inspected by the Duke of Cambridge on his visit to Malta. 851 all ranks were on parade. 16 June 1892 The first annual training camp was held at Fort Mosta under canvas. The regiment marched from its barracks in Lower St Elmo Valletta to Mosta. The training lasted ten days. 595 men attended the camp. Each man was required to attend a minimum of 50 drill days during the year. 22 Sep Death of Lt Col Frederick Gatt RMRM. 7 Feb 1893 Maj Henry Vella was gazetted Lt Col and commanding officer 1st/RMRM, backdated to 23 September 1892. 6 May The regiment was 677 strong. It underwent a twelve day training camp under canvas at Pembroke. 17 Apr 1894 The regiment was 695 strong. It had a twelve day training camp under canvas at Pembroke Camp. In August the men were issued with their Lee-Metford Rifle and sword bayonet. Oct 1894 The RMRM had its HQ and six companies at Valletta, two companies at Vittoriosa, one company at Mdina and a company shared between Naxxar and Zebbug. 1 Jan 1895 New Colours were presented to the regiment by Lady Fremantle at St John's Co-Cathedral. The inclement weather forcing a change of venue from the Floriana Parade Ground to the cathedral. 23 Apr The regiment, 643 strong, had its training camp under canvas at Pembroke Camp. 21 Apr 1896 The regiment, 809 strong, had its fifth annual training camp. Royal Malta Regiment of Militia Sept 1896 showing Spr P Caruana S M Miners RE (Winter dress) , Pte Ciantar (Marching Order) Sgt Buhagiar (Walking out dress), Sgt Maj W Morrison (Review Order) Lt Col H Vella CO, Maj R P Samut, Cpl G. B. Vella S M Miners RE (Summer Dress), LCpl Brockdorff RMRM Cadet Coy (Drill Order) (from Chesney A. G.). 16 Nov 1897 Resignation of Lt Col Henry Vella 1st/RMRM who was succeeded by Lt Col J. L. De Piro as commanding officer on 17 November. The names of the officers of the Royal Malta Regiment of Militia appear for the first time in the Army List dated July 1899. The Surgeon to the Corps was listed as A Mifsud. His commission was dated 1 May 1889. 10 Jan 1900 The Commanding Officer requested permission of the War Office for half of each militia regiment to form one regiment for duties as part of the garrison of Malta. The War Office, however, did not call for the services of the RMR of Militia. 7 May In 1900 a number of officers of the Royal Malta Regiment of Militia were granted commissions as 2nd Lt with British Line regiments. The militia officers who volunteered to join British regiments in the Boer War (1899-1902) left Malta on 7 May 1900. 17 Nov 1902 Lt Col N Grech Biancardi became commanding officer on the retirement of Col De Piro. Dec 1903 Strength: 30 Officers and 892 men. The Officers' Mess and Orderly Room were at the Palace Valletta. The 1st Battalion was commanded by Lt Col N G Grech Biancardi who resided at at 15 Strada Cristofero Valletta. 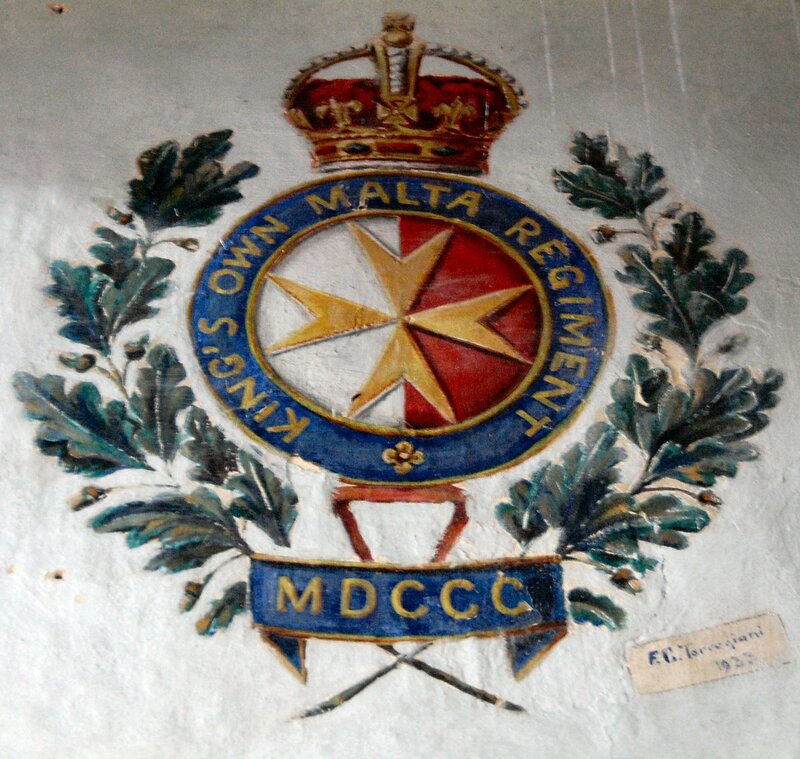 1 June The regiment was designated The 1st Battalion The King's Own Malta Regiment of Militia in consequent of the visit of King Edward VII to Malta on 16 April 1903. 6 May 1910 Death of King Edward VII from pneumonia aged 68 years. His eldest son George Prince of Wales was crowned on 22 June 1911 as King George V.
24 May 1911 A Maltese contingent from the Royal Malta Artillery and the 1st and 2nd Battalions KOMRM left Malta on 24 May 1911 to attend the coronation. The contingent returned to Malta on 9 July 1911. 28 July 1914 Start of the Great War. Britain declared war on Germany on 4 August 1914. 2 Aug The KOMR (Militia) was embodied by proclamation issued by the Governor and Commander-in-Chief Sir Leslie Rundle. On 6 August the 1st and 2nd Battalions took up their war positions around the coast of Malta and occupied posts at Verdala Barracks, Portes-des-Bombes tent encampment on the glacis opposite Ta' Braxia Cemetery, Fort Manoel and Fort Lascaris Valletta. The 2nd/KOMR (Militia) also guarded prisoners of war at Salvatore Barracks. 12 Sep F Coy KOMRM moved from Floriana Barracks to Lower St Elmo Barracks. 14 Sep The KOMRM received orders to move into their war stations on 16 September. 7 Nov 1914 The 1st/KOMRM at Verdala Barracks mutinied over pay. 14 Jan 1915 At the outbreak of the Great War, Britain annexed Cyprus, having declared war on the Ottoman Empire. Headquarters and two companies (half a battalion) 1st KOMRM (560 officers and men from both battalions) left for garrison duty in Cyprus. Surgeon Major Robert Samut was in medical charge. The officers received British Infantry rates of pay while at Cyprus. The wives and families of the Cyprus contingent were paid monthly in advance. The detachment returned to Malta in September 1915. 1st/KOMRM took camp equipment at Ghajn Tuffieha from 4th City of London Regiment Royal Fusiliers. 28 Jan 2nd Lt Laferla KOMRM joined the Pay Office for duty as acting paymaster. 25 Mar Mr E G Cumbo of 42 Strada Zaccaria Valletta, a qualified civilian dispenser was sent to Cyprus for duty with the detachment of the KOMRM. Sep 1915 864 men left Malta for Gallipoli under the command of Maj J V Aspinall and Lt L L Muscat. On 31 December 1918 the strength of the Militia Battalions in Malta stood at 2278 men (1st/KOMRM 1092 men, 2nd/KOMRM 1092 men and the 1 Coy RE (Militia) Malta Division 94 men). Despite the Governor's proposal that the two Militia Battalions be retained, the Colonial Office was not in favour of having the KOMR Militia permanently embodied. The War Office took the view that the Militia could not be relied on for the maintenance of internal order. The two British Battalions in Malta were considered sufficient for the maintenance of internal order and the two Militia Battalions were reduced. 31 Dec 1921 Fortress Orders No 1098, declared in accordance with War Office instructions No 430 of 27 September 1921, the 1st and 2nd Battalions King's Own Malta Regiment of Militia will disband on 31 December 1921. 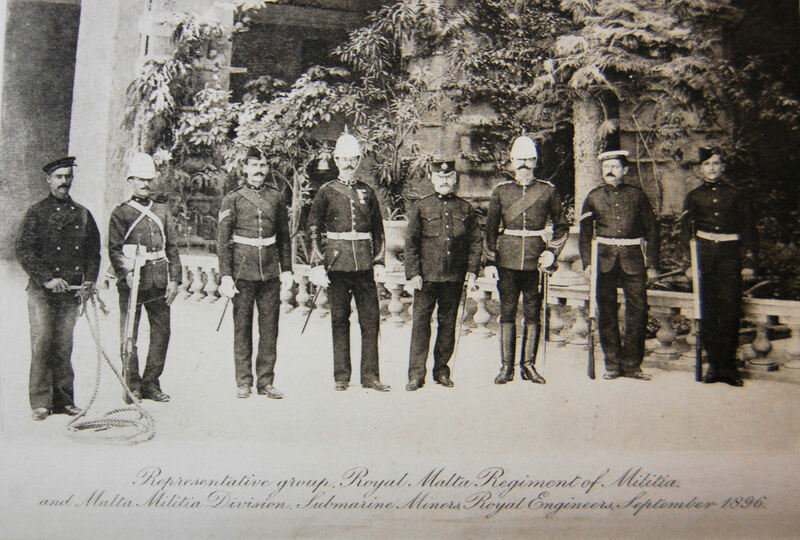 The 2nd/Royal Malta Regiment of Militia was raised on 12 March 1897. It was initially commanded by Major A G Chesney Staffordshire Regiment, but on 4 November 1897 command of the battalion passed on to Lt Col R P Samut RMRM, who held the command until his retirement on 4 December 1901. 14 June 1899 New Colours were presented to the 2nd/KOMR by the Governor Field Marshal Francis Wallace Grenfell (6 January 1899–18 March 1903). 10 Jan 1900 The Commanding Officer made a request for half of each militia regiment to form one regiment for duties as part of the garrison of Malta. The War Office, however, did not call for the services of the RMR of Militia. 1 June 1903 The regiment was designated The 2nd Bn The King's Own Malta Regiment of Militia consequent to the visit of King Edward VII to Malta on 16 April 1903. Dec 1903 The battalion strength was 30 officers and 799 men. It was established for 1,090 men. The 2nd Battalion was stationed at Cospicua. Its Head Quarters was at 64 Strada Ponente Valletta. The Officers' Mess and Orderly Room were at the Palace Valletta. It was commanded by Lt Col J. L. Francia who resided at 310 Strada Reale Valletta. 2 Aug 1914 The KOMR (Militia) was embodied by proclamation issued by the Governor and Commander-in-Chief Sir Leslie Rundle on 2 August 1914. On 6 August, the 1st and 2nd Battalions took up their war positions around the coast of Malta, and occupied posts at Verdala Barracks, Portes-des-Bombes tent encampment on the glacis opposite Ta' Braxia Cemetery, Fort Manoel and Fort Lascaris Valletta. The 2nd/KOMR (Militia) guarded prisoners of war at Verdala Barracks. 18 Aug Moved into camp at Fort Mosta from Attard. 14 Jan 1915 A contingent of 560 officers and men from both battalions left Malta for garrison duty in Cyprus. The men were promised that they would be relieved within 3 months but had to stay in Cyprus due to lack of transport. The KOMRM were kept in the fever-stricken plains rather than the healthier Troodos Mountains. They returned to Malta in Aug 1915. On the outbreak of the Great War, Britain annexed Cyprus having declared war on the Ottoman Empire. 15 Feb The detachment of the City of London Regiment on guard duty of the Prisoners of War at Salvatore Barracks was relieved by a detachment of the KOMRM. 5 Mar The 2/4th (City of London) relieved the KOMRM at Salvatore Barracks. Sep 1915 864 men left Malta for Gallipoli. The medical officer on the expedition was Capt S Vella RAMC. In September 1915, 864 men left for Salonica under Maj J V Aspinall KOMRM and Lt J L Muscat KOMRM to work as stevedores for three to six months. The stevedores returned to Malta in November 1915. 17 Feb 1916 The Maltese Labour Battalion returned to Malta from Murdos. It was commanded by Maj Aspinall KOMRM while in service in the Dardanelles. 7 Nov Doris Henrietta Hicks born on 5 October 1917, daughter of RSM Henry Hicks 2/KOMRM and Eva resident at 5 WO's Quarters St Francis Ravelin Floriana. Between 27 November and 5 December 1915 there were a number of scuffles between Australian convalescent soldiers from All Saints (Pembroke) and Spinola Camp and men of 4th/KOMRM. Soldiers from the Royal Garrison Artillery and West Yorkshire Regiment were repeatedly deployed to restore order. The KOMRM were confined to barracks and prohibited from approaching Sliema. 21 Sep 1916 No 1 Maltese Labour Battalion embarked for Salonica under the command of Major C D Vella 1st/KOMRM. The officers were: Lt (QM) J Adair 1st KOMRM as Adjutant, 2nd Lt J V Chapelle 1st/KOMRM, 2nd Lt E W Huber 1st/KOMRM, Lt C Pace 2nd/KOMRM and Lt S Samut Tagliaferro 2nd/KOMRM. Captain A Vella RAMC was medical officer in charge. Rev Canon S Cauchi and Rev G Bezzina were Chaplains to the Battalion. Three Acting CSM 1st/KOMRM, 3 Acting Sgt Majors 2nd/KOMRM, 1 Dispenser, 6 Hospital Orderlies, 307 Stevedores and 502 labourers were on the strength of the Maltese Labour Battalion. 26 Sep The battalion disembarked at Salonica. The stevedores were encamped at Karaissi under the command of Lt C Pace 2nd/KOMRM and 2nd Lt J V Chapelle 1st/KOMRM; the rest were encamped near the main Ordnance Depôt on the Monastir Road. Three Hospital Orderlies were attached for duty with the Stevedore Detachment. 7 Oct A detachment of 1 Acting Company Sergeant Major (A/CSM) and 137 labourers under the command of Lt S Samut Tagliaferro proceeded to Beschinar Gardens Salonica for duty at the Base Ammunition Depôt. The rest were employed at the Main Ordnance area and Main Ammunition Depôt. 31 Oct 216 labourers arrived in Salonica from Malta. 2 Nov 2nd Lt Edgar W Huber was knocked over and killed by an Italian lorry near 4 Kilo on the Monastir Road. 23 Dec 1916 307 stevedores embarked for Malta under Lt C Pace on termination of their contract. 27 Jan 1917 238 labourers under 2nd Lt J Psaila Manche 1st/KOMRM disembarked at Salonica from Malta. 4 Feb The Rev Canon S Cauchi, 2 Hospital Orderlies and 621 labourers embarked for Malta on the termination of their contract under the command of 2nd Lt J V Chapelle 1st/KOMRM. 26 Feb Head Quarters 1st Maltese Labour Battalion moved to Macedonia Hotel Camp. 30 Mar 1 Dispenser, 3 Hospital Orderlies and 36 labourers embarked for Malta on the termination of their contract. 5 Apr No 2256 Labourer G Dimech was killed and No 2221 Labourer D Caruana was wounded in an air raid at Karasouli. 19 Apr 2nd Lt J V Chapelle 1st/KOMRM, 2nd Lt C Xuereb 2nd/KOMRM, Rev P B Demicoli, 2 Hospital Orderlies and 543 labourers disembarked at Salonica from Malta. 28 Apr Rev G Bezzina and 17 labourers embarked for Malta on termination of their contract. 15 July 1917 219 labourers embarked for Malta on termination of their contract under Lt C Xuereb. 29 Aug Lt S Samut Tagliaferro assumed command of the battalion during the absence in hospital of Maj C D Vella. 1 Oct 2nd Lt C Xuereb 2nd/KOMRM returned from Malta in charge of 4 NCOs KOMRM and 500 labourers. 2 Oct 2nd Lt J Psaila Manche 1st/KOMRM returned to Malta in charge of 352 labourers. 26 Oct Maj C D Vella was invalided to Malta on a Hospital Ship. Lt S Samut Tagliaferro was promoted Acting Captain on 12 September 1917 and took command of the unit. 13 Nov Rev P B Demicoli was invalided to Malta on a Hospital Ship. 11 Dec 1917 2nd Lt V A Trapani 1st/KOMRM, Rev S Mangion and two hospital orderlies arrived at Salonica from Malta. 1 Feb 1918 No 3243 Labourer P Caruana was knocked over by an engine and killed at the crossing near Dudular Railway Stores. 8 Feb Capt J Adair, 2 Hospital Orderlies and 33 labourers embarked for Malta. 1 Apr Capt A Vella RAMC was transferred for duty at No 28 General Hospital. 30 May Rev S Grima and Rev A Borg disembarked from Malta. 6 June Rev G Farrugia, 1 hospital Orderly and 263 labourers No 2 Maltese Labour Battalion left for Malta. 31 July 1918 No 9685 Sgt J Hill and 101 Labourers of No 1 Maltese Labour Battalion and 18 Labourers No 2 Maltese Labour Battalion left Salonica for Malta under 2nd Lt W L Bonello Maltese Employment Coy. 7 Aug 1 Sgt, 154 time expired labourers, 2 medically unfit labourers 1st Battalion Maltese Labour Corps (MLC), 3 time expired labourers 2nd/MLC left for Malta via Bralo under 2nd Lt J E Degiorgio 2nd/MLC. 27 Aug Capt A Agius, 2nd Lt Amato Gauci KOMRM, 2nd Lt J E Degiorgio 2nd/MLC, 2 hospital orderlies and 559 labourers, 154 time expired labourers, 2 medically unfit labourers 1st/MLC disembarked from Malta. 28 Aug 2nd Lt J E Degiorgio and 150 labourers left to join 2nd/MLC. Capt A Vella RAMC left for Italy via Bralo on 21 days leave. 30 Aug 1918 Capt A Agius KOMRM left Salonica for Malta via Bralo. 13 Oct 1917 750 labourers, chiefly coal heavers and farmers from Malta and Gozo, were recruited between 13 and 16 October 1917 in the 2nd Maltese Labour Battalion. The men were recruited a week prior to embarkation and stayed at home until called forward to embark. The Battalion was due to leave Malta for Salonica on 20 October, but was delayed due to lack of transport. It embarked on 5 December 1917. As many had left their jobs in October, the period waiting for departure caused financial hardship but the men were given a retaining grant of six pence a day to mitigate their losses. The strength of the battalion was increased from 750 men to a 1000, and an additional 250 men were taken on by the Labour Recruiting office at Lascaris Barracks. The men were engaged for six months from their date of embarkation, with an option to extend for a further three months. They were paid two shillings six pence a day with no separation allowance. Leading labourers received an one shilling six pence extra pay. Officers of the 1st and 2nd Battalions the King's Own Malta Regiment of Militia and the men of the Labour Battalions had all volunteered for overseas services. 10 Dec 1917 The 2nd Maltese Labour Battalion disembarked at Salonica under the command of Major Frank Stivala 2nd/KOMRM and proceeded to Dudalar. On 19 December the men were distributed in several detachments to Causica, Snevce, Gugunci, Sarakli, Seres Road, Kilo 58, Kilo 70 and Salamanli with Janes as HQ. They were employed in loading and unloading stores and ammunition at Rail heads; 250 men at Sarakli laid a Decauville Line from Sarakli to Stavros. At Kilo 54 Seres Road they built roads and cut drains and trenches. From 10 December 1917 and 28 Feb 1918, one labourer was killed in a Railway accident at Causica and two died from natural causes. Four labourers were returned to Malta as medically unfit. The Director of Railways directs me to convey to all officers and other ranks employed on the Stavros Line his appreciation of the celerity with which the work has been carried out. The Commander-in-Chief is very pleased with the progress made. 31 Mar The 2nd/Maltese Labour Corps was distributed into nine detachments at Janes, Gugunci, Karamudli, Causica, Spancovo, Lahana, Seres Road Kilo 70, Likovan and Pazarkia. Apr One death was recorded during the month from Cerebro Spinal Meningitis. Six labourers were invalided to Malta. 31 May 1918 The Battalion was distributed into 14 detachments at: Janes, Gugunci, Causica, Kalinova, Spancovo, Oreovica, Vergator, Karamudli, Seres Road Kilos 52 1/2, 60 1/2, and 70, Likovan, Kerpatchy and Kopaci. Three labourers were invalided to Malta. 6 June Rev G Farrugia and 263 labourers No 2 Maltese Labour Battalion left for Malta. 8 June Rev A Borg left for No 49 General Hospital. 18 June 1918 Rev A Grima left for No 25 Casualty Clearing Station. 9 Feb 1918 No 1 Maltese Employment Company consisting of 14 Cooks, 42 waiters and 63 servants were enrolled at Malta and proceeded to await passage at the Depôt under the command of Captain C F von Brockdorff RMA. 16 Feb The Company embarked for Salonica. It arrived at Itea Greece on 20 February, entrained at Bralo for Salonica, and arrived at the Orient Station on 24 February. 24 Feb No 1 Maltese Employment Company proceeded to Labour Corps Base Depôt at 6 1/2 Kilo Seres Road. 16 Mar Lt W L Bonello with 16 cooks, 18 waiters, 100 servants and 3 NCOs arrived at Salonica to complete the establishment and proceeded to Labour Corps Base Depôt. 26 Apr 1918 CSM Cassar and 156 Pte A Sciberras were evacuated on the Hospital Ship Braemar Castle to Malta as invalids. 7 May No 36 C Stivala, No 96 E Micallef, No 228 I Caruana, and No 25 Cascio Alfredo entrained to Bralo for Malta for discharge being unsuitable for the work for which they were engaged. 21 July Labourer Perry was transferred voluntarily from 1st/Maltese Labour Battalion to 1st/ Maltese Employment Company. 30 July No 154 Pte Jos Pace was listed dangerously ill suffering from pneumonia. He died on 12 August 1918 at No 21st General Hospital. 4 Aug 1918 No 138 Pte Scicluna, No 198 Pte Gino Grech and No 247 Pte F Buttigieg were admitted to No 28th General Hospital from Marsh Pier Army Service Corps with malaria. The 1st/KOMR was reconstituted on 9 Nov 1931 under the command of Lt Col Percy Worrall CBE DSO Devonshire Regiment. It was allocated the first floor of the Main Guard Valletta as its officers' mess. Its Regt HQ was at Lower St Elmo Barracks Valletta. 1932 The Officer's Mess was established on the 1st Floor of the Main Guard Valletta. 1 July 1933 Surg-Lieut S. F. Mattei was the first medical medical officer to be commissioned in the KOMR. Dec 1934 D Coy 1st/KOMR was raised in Gozo. 5 May 1935 New Colours presented to the battalion at St John's Co-Cathedral, by the Governor and Commander-in-Chief Sir David Graham Muschet Campbell. Command of the 1st/KOMR passed from Lt Col P. R. Worrall to Lt Col Edgar J. Vella KOMR. The battalion occupied Lower St Elmo Barracks. 26 Aug 1939 The regiment was embodied in preparation for war. It took over St George's Barracks at St George's Bay which had been vacated by 2nd/Royal West Kent Regiment. The battalion was entrusted with the defence of the northern part of Malta, north of Bajada Ridge. Bn HQ was at Mellieha. It formed part of the Northern Brigade under Brigadier W. H. Oxley. 21 Sep 1939 Raising of the 2nd Battalion KOMR. Distribution of the infantry June 1940 with their supporting Regimental Aid Posts, Medical Aid Posts and Advanced Dressing Stations (from Crew F. A. E. History of the Second World War p 622). No 6360 Pte Louis Gatt KOMR died 19 Dec 1940 aged 35 years. In 1940, Lt Col R. Payton-Reid was appointed commanding Officer 1st/KOMR. June 1940 HQ 1st/KOMR was at Mellieha. An RAP was at Marfa. This was well kept by the stretcher bearers 1st/KOMR who cut their own slit trench in the very hard rock. 1/KOMR dispersed its Reserve Coy so as to deal with enemy landings in area square 3134, Il Mziep (Grid 3232), Wied il Mistra (Grid 3532) and Pumping Station (Grid 3132). 7 Aug Became part of Northern Infantry Brigade. Bn HQ and HQ Coy at Tal Virtu Rabat. A Coy Passive Air Defence HQ and two platoons at Pembroke and one platoon at Tigne. B Coy HQ at Rabat old 1/KOMR drill hall, C Coy anti parachutist HQ Verdala Palace, D Coy anti parachutist. 8 Aug No 1559 Pte Muscat B Coy 1st/KOMR was treated at MAP Mellieha for a lacerated wound to his left hand following a booby trap explosion at Selmun. He was evacuated to Mtarfa Hospital. 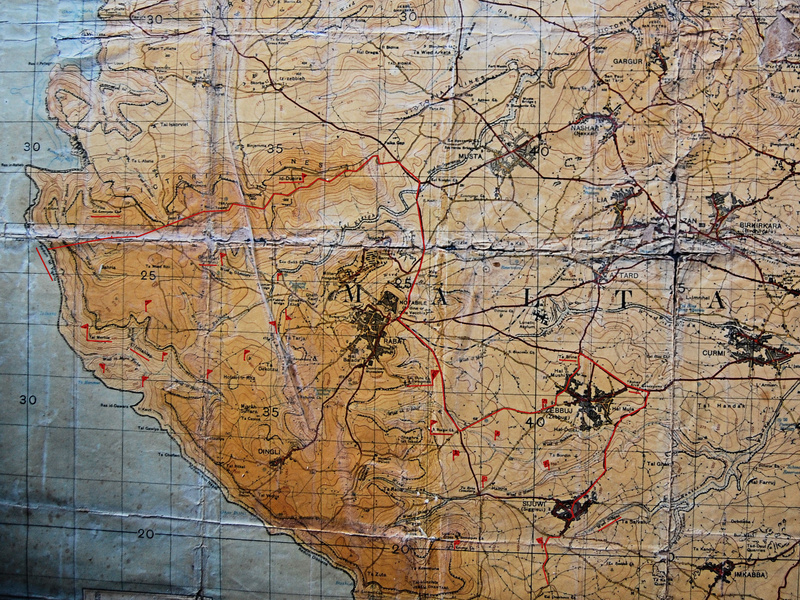 MAP Mellieha was administered by the RAMC and ceased to remain a regimental asset. 17 Aug No 1786 L/Cpl Brincat E Coy 1st/KOMR was treated at MAP Mellieha for a gunshot wound to his 3rd and 4th fingers left hand. He was evacuated to Mtarfa Hospital. 12 Oct No 4854 Gnr G Micallef 4 Heavy Bty RMA was treated at MAP Mellieha for a gun shot wound to the abdomen and right hand. He was evacuated to Mtarfa Hospital. 19 Dec 1940 Sudden death of No 6360 Pte Louis Gatt B Coy 1st/KOMR stationed at Selmun Palace. 1 July 1941 Strength: 27 officers and 879 men. The KOMR was at Tas Salvatur where the men were under canvas. Oct 1941 Lt Col W H G Goater DSO MC became commanding officer 1st/KOMR. 31 July 1946 The 1st Bn was placed in suspended animation under Special Order 97484SD2B dated 13 Feb 1946. 1 Sep 1951 The 1st/KOMR was reconstituted in September. It was located at St Francis Ravelin Floriana. 2 June 1953 In 1953 the 1st/KOMR with a contingent from 3 LAA Regt RMA (T) and 11 HAA Regt (T) attended the coronation of Queen Elizabeth II. 28 May 1957 The KOMR was granted the Battle Honour Malta 1940–42. In 1959 the KOMR was granted the privilege of carrying the George Cross on the Regimental Colour. 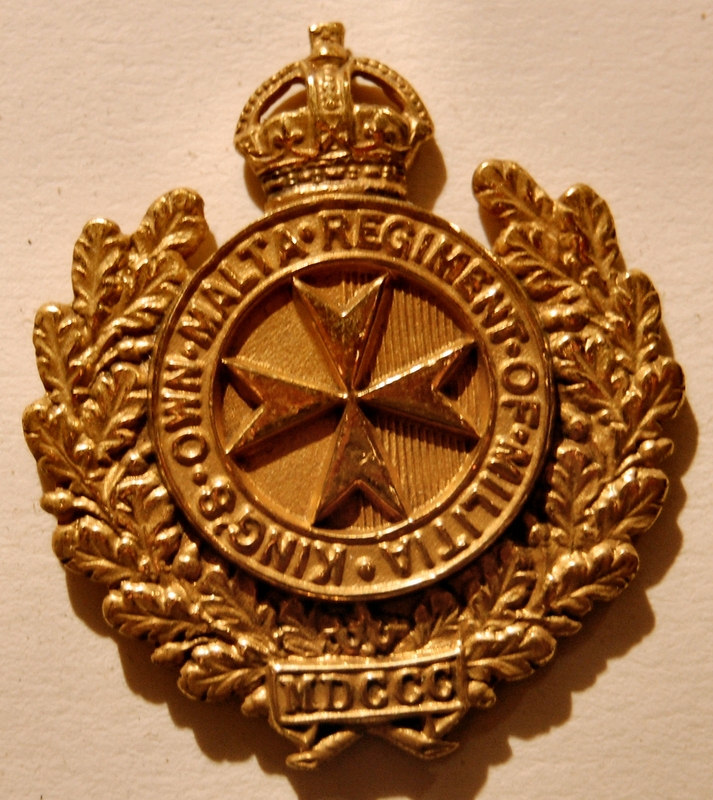 1972 The 1st/King's Own Malta Regiment was disbanded. 21 Sep 1939 HQ 2nd/KOMR moved to Tal Virtu with a company at Verdala Palace. 22 Jan 1940 2nd/KOMR moved into Wolseley Camp from St Andrews Barracks. On 27 January, 2nd/Royal West Kent handed Mtarfa Barracks to 2nd/KOMR which moved its Passive Air Defence Coy into Mtarfa. In January 1940, C Coy was assigned for duties at RAF Stations, D Coy HQ was at St Paul's Hutments, E Coy HQ Lintorn Barracks Floriana. 2nd/KOMR HQ was at St Paul's Hutments. Apr A Coy HQ was at Mqabba. 4 June The new Scout's Own Company 2nd KOMR started recruiting all scouts and ex scouts who were to serve together in this company. A distinctive badge was to be worn by personnel of the Scout's Own Company. Those scouts of over 17 years six months who wished to enlist were to report to Upper St Elmo Barracks. July HQ 2nd/KOMR was at Tal Virtu with a company at Verdala Palace Buskett. Aug 1940 The 2nd Battalion was commanded by Lt Col A.V. Mallia KOMR. Bn HQ was at St Andrew's Barracks. War Office Map 1933, 2 inch to the mile, showing 2nd/KOMR sector with location of observation posts. The 2nd/KOMR's mission was to destroy at their point of landing all attempts by the enemy to land troops by air within the sector and to defeat any attempt by the enemy to seize ground vital to the defence of the island. Its Area of Responsibility (AOR) extended west of a line from Ir Redum (303256) to Saint Martin Church (317257), along road to Nadur Tower (341264), eastwards along road to bend in road (370274), along the Victoria Lines to road junction (373271), south to and along the eastern road at Mtarfa to cross roads (378253), south along road to 373243, south to cross roads 386223, east along road to Zebbug, then north along west edge of Zebbug to cross roads 408238. The Battalion boundary then went south along the road to Is Shakka along the line which separated Northern from Southern Brigade. Bn HQ and HQ Coy were at Tal Virtu (375232). Other units in the area were a signal station at Id Dweira (3526), an OP at Tal Merhla (315239), and a search light Section at St Biagio (3822). The battalion had two Passive Air Defence (PAD) platoons at St Andrews Barracks, one at Tigne and one PAD Plt at Mtarfa. PAD HQ was at St Andrews Guard Room. The battalion had a Vulnerable Points Coy (VP) with a Coy HQ at Mdina. Guards were mounted at Dweira, Museum Railway Station, Rabat Railway Station, Mosta Fort and Gharghur Battery. C Coy HQ was at Verdala. It maintained a number of anti parachutist post at T V 1 (380233), T V 2 (393231), T V 3 (401226), T V 4 (405217), T V 5 (385219), T V 6 (391211), T V 7 (387203), T V 8 (402201). A platoon was at the Inquisitor's Palace (3720) with an OP at Laferla's Cross (386204). D Coy HQ was at Gomerino (339257). It had a platoon at Mtahlep (3224) and one at Il Concezioni (318268). The Mtahlep platoon manned the following posts: I T 1 (325242), I T 2 (327237), I T 3 (337231), I T 4 (323228), I T 5 (314234). The Concenzioni Platoon came under the command of 8th Manchester Regiment. It manned the following posts: F B 1 (343256), F B 2 (351250), F B 3 (353247), F B 4 (351240), F B 5 (346236). 31 May The battalion strength was 30 officers and 684 men. 26 June B Coy 2nd/KOMR passed to the command of Static Group KOMR and became X Coy. 30 June 1941 The following officers were posted to Static Group KOMR: Capt F Cassar Torregiani, Capt J F Gatt, 2nd Lt F A Asphar, 2nd Lt S Stivala, 2nd Lt G L Zammit, 2nd Lt S E Micallef, 2nd Lt H S Sullivan, 2nd Lt G M Borg Testaferrata. 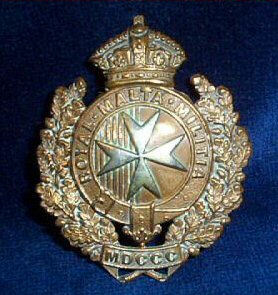 31 July 1946 The 2nd/King's Own Malta Regiment was disbanded under Special Order 97484SD2B dated 13 Feb 1946. 1940 The 3rd Battalion was established at the Camerata Valletta under the command of Lt Col Mario Apap Bologna KOMR. The raising of the 3rd and 10th Battalions KOMR were made possible following the enactment of the Conscription Act of 21 Feb 1941, which made available for military service men between the ages 18 and 41 years. 1941 The battalion moved to South East Malta as part of Southern Brigade. It defended the airfields of Hal Far, Luqa and the airstrips at Safi and Qrendi when these opened in 1942. 16 Jan First dive bombing attack over Grand Harbour. B Coy (Demolition and Light Rescue) did good work and saved lives at Senglea which had been badly bombed in recent raid. Parties from Bn HQ 3/KOMR worked also on night shifts. A Coy at Mqabba, 3 Officers and 79 Rank and File. B Coy at Floriana, 3 Officers and 62 Rank and File. C Coy at Kalafrana, 6 Officers and 165 Rank and File. D Coy at Floriana, 4 Officers and 158 Rank and File. HQ Coy at Camerata, 6 Officers and 58 Rank and File. HQ Coy at Wolseley Camp, 6 Officers and 58 Rank and File. 13 Feb The battalion had its first fatal casualty of the war when a bomb exploded at the military hospital Mtarfa killing no 7858 Pte Robert McGill 3/KOMR. He was buried at Mtarfa Military Cemetery. 6 Mar A bomb landed on the Auberge de Bavarie behind BN HQ. There were no casualties. 22 Mar The Military Medal was awarded to Sgt A Kitney C Coy 3/KOMR. Apr Battalion HQ, HQ Coy and D Coy moved from the Camerata Valletta to Qrendi (Guarena Palace). 3 June A Coy and HQ Coy moved to Qrendi from Mqabba. 26 June 1941 F Coy (old C Coy) 3/KOMR Aerodrome Defence passed to the command of Static Group KOMR but retained its relationship with the RAF. 27 June G Coy (old D Coy) 3/KOMR Vulnerable Points passed to the command of Static Group KOMR and became Z Coy. 2 Aug Formation of D Coy 3/KOMR at Guarena for the defence of Qrendi Strips under the command of Capt J E Johnston. Coy HQ was at Tal Merhla Church (Grid 410185). Rev J Borg CF assumed the duties of Unit Chaplain. 31 Aug Unit strength 3/KOMR: 18 officers and 636 Other Ranks. 24 Sep Formation of E Coy 3/KOMR with Coy HQ at 21 Ghajn Dwieli Street Paola under the command of Capt W C Aumayer. 15 Nov A Coy 3/KOMR moved from Qrendi to Paola and manned Anti Aircraft Posts at Luqa Aerodrome. Men were at Ta' Kandja and St Edwards College. 15 Nov B Coy 3/KOMR moved from Paola to Qrendi. 10 Dec 1941 B Coy HQ 3/KOMR moved from Qrendi to Hagar Qim Bar. 1943 The 3rd Battalion moved to Tarxien and relieved the 2nd/Devonshire Regiment which left Malta for Egypt in preparation for the invasion of Sicily. 1945 The 3rd/King's Own Malta Regiment disbanded. 23 June 1941 KOMR Static Group came into being under Authority CR Malta No 25158/8/A dated 18 June 1941. Lt (Temp/Capt) A V Mallia KOMR relinquished his post of Staff Captain and was appointed Acting Major and officer commanding from 23 June with Lt J F Pace Bonello was appointed Assistant Static Group with effect from 23 June 1941. 2 Plts from A Coy 2nd/KOMR (PAD duties) passed to the command of OC No 5 PAD Area Pembroke but remained on the strength and establishment of Static Group KOMR with its HQ at St Andrews Barracks. 1 Plt from A Coy 2nd/KOMR (PAD duties) passed to the command of OC No 4 PAD Area Tigne but remained on the strength and establishment of Static Group KOMR. 26 June F Coy and G Coy 3/KOMR were absorbed by Static Group KOMR and became C Coy and A Coy respectively. 1 July 1941 B Coy 2nd/KOMR was absorbed by Static Group KOMR. The 10th Battalion was raised in 1941 at Paceville. It formed part of Central Infantry Bde (233 Bde) under Brigadier De La Bere. The 10th/King's Own Malta Regiment was disbanded in 1944. Wismayer, J. M. 1989. The history of the King's Own Malta Regiment First Edition, Valletta Said International Ltd. pp. 114-136, 163, 178-238. TNA:WO 169/3275. War Diary Static Group KOMR . TNA:WO 169/3276. War Diary 1st/KOMR . TNA:WO 169/3277. War Diary 2nd/KOMR . TNA:WO 169/3278. War Diary 3rd/KOMR . TNA:WO 177/113. 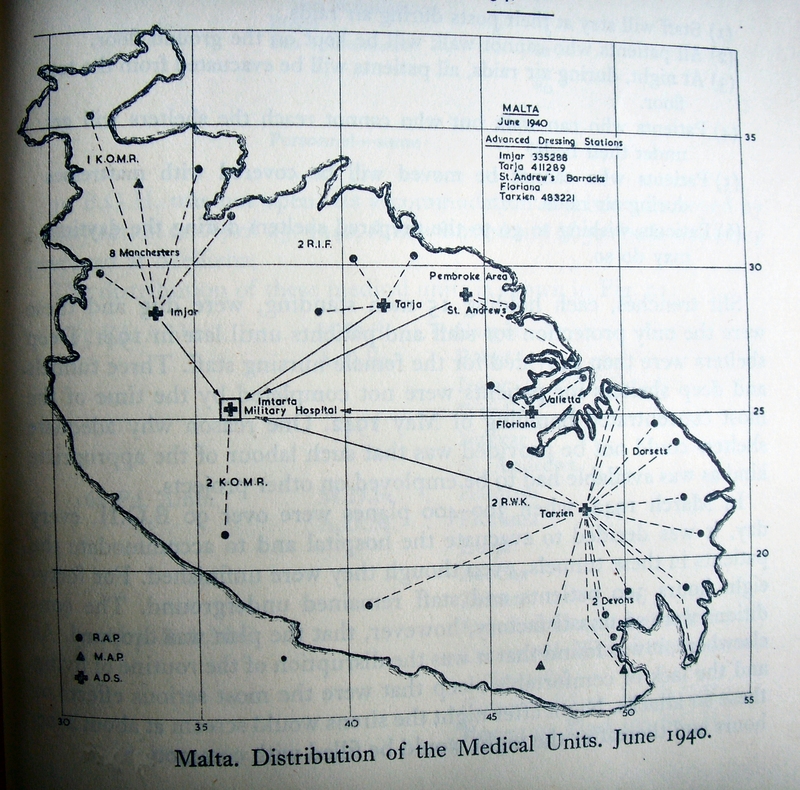 Medical Diaries MAP Mellieha May to December 1940 and March to June 1941. Starling J and Lee I. No Labour, no battle, military labour during the First World War. History Press 2014. Caruana A and Zammit W. The Maltese Labour Corps during World War I. University of Malta 2011. TNA:WO 95/4944. War Diaries Maltese Labour Corps. TNA:CO 323/807. Colonial Garrisons 1919.